The debates, which will happen on February 17, February 24, and March 3 from 7 pm to 9 pm, will give voters a chance to hear the candidates’ position on pressing national issues before they cast their votes in the midterm elections on May 13. Trusted broadcast journalists Karen Davila and Alvin Elchico will anchor “Harapan 2019,” which will tackle important topics to Filipinos today such as job security, health, education, prices of goods, peace and order, and more. For the first town hall debate on February 17, guests include Bam Aquino, Glenn Chong, Chel Diokno, Larry Gadon, Samira Gutoc, Florin Hilbay, Jiggy Manicad, Willie Ong, Koko Pimentel, and Francis Tolentino. 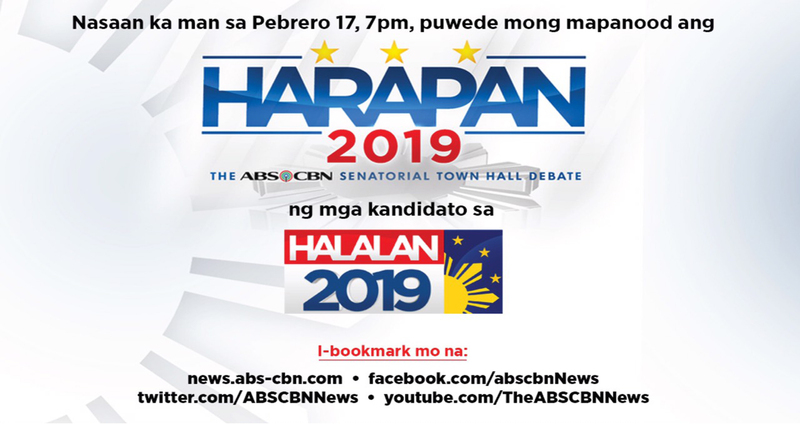 “Harapan 2019: The ABS-CBN Senatorial Town Hall Debate” is part of ABS-CBN’s comprehensive coverage for Halalan 2019.